The best ways to publicize your THATCamp in order to recruit participants: email, web forums, Twitter and other social media, fliers, and by keeping THATCamp Central apprised of your plans. There’s an infinite amount of publicity you can do for a THATCamp. If you have willing helpers, put them on publicity duty — draft an e-mail announcement (see a template for a typical THATCamp announcement here) with the link to the registration form and ask your helpers to e-mail it to people, organizations, and departments who might be interested. They can do likewise for topic-focused forums and listservs. Be sure that your announcement carries a notice such as “Please distribute widely” so that others are encouraged to spread it around. 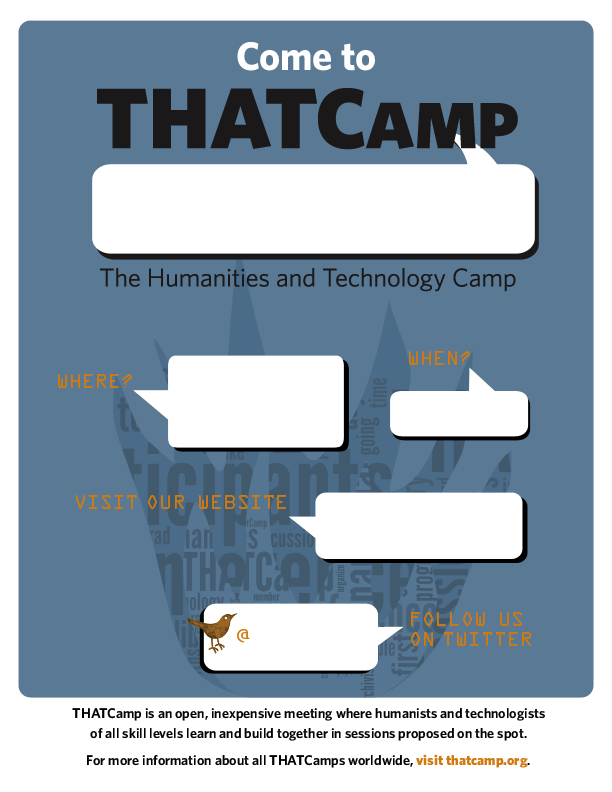 The #thatcamp hashtag gets lots of traffic and is regularly perused by THATCamp junkies, so if you make sure to have a Twitter account and use the hashtag #thatcamp, the word will be sure to get out. The @thatcamp account also regularly retweets tweets from THATCamp accounts. Fliers – Don’t forget to advertise locally. Chris Raymond, our designer, has thoughtfully created a set of THATCamp flier templates (.zip) at thatcamp.org/docs/thatcamp-fliers.zip in .docx and .tif format that you can customize and post around campus or around town. The blue version is depicted above.